Monday morning – it often fills a Sunday night with dread. Our lives are so busy that we can find ourselves wondering how exactly we are going to cram everything in that needs to be done. I live by my calendar and sometimes find myself staring at it thinking ‘how?’. Today, armed with a strong black coffee I am taking a different outlook. This Monday is a fresh start, a new day and the beginning of a new week full of promise. 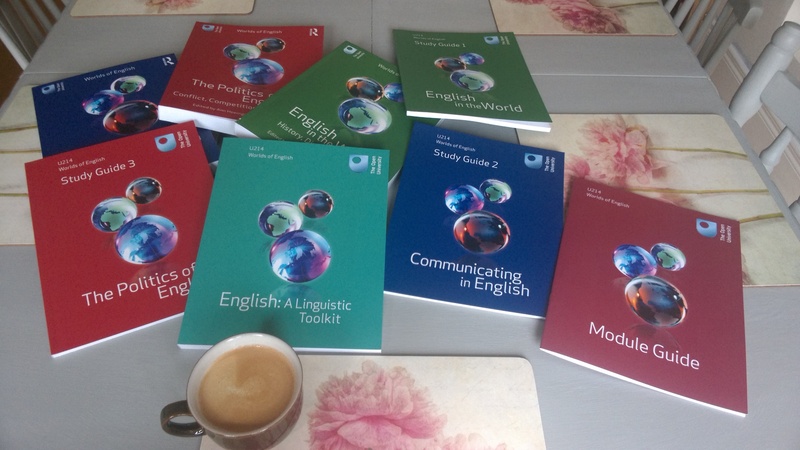 A few months ago I enrolled on an Open University degree course and two weeks ago my books…my many many books arrived with the post and so far I haven’t had opportunity to really look at them in detail to find out what exactly the course entails. I stayed at home as a full-time Mum while my children were small. I adored this chapter of my life and put my all into it. My youngest child started primary school last year so I returned to the workplace in a part-time capacity and am thoroughly enjoying the challenge that brings. Juggling family life and work is not easy as I am sure any parent will testify (hats off to anyone that works full-time), but it is good, for me, to have that variety of things in my week. It means being super organised and always thinking a week ahead but it works for us as a family so I am rolling with it. I have always enjoyed studying. I have a big passion for writing too, hence this blog, and a love for the English language. So, when the idea of doing an English degree was mentioned to me, I pondered it for a while, and eventually thought ‘why not?’. So, here I am, kids bundled off to school, cats fed, laundry in the machine, settling into this new phase of my life. Having had a quick scan over some of the materials I have to study in my first module ‘Worlds of English’ I have to admit my emotions are somewhat mixed. I am excited, nervous, curious, intrigued and fascinated and a little scared. This first module looks at the history of the English language, so I know this will be particularly challenging for me as I was always rubbish at History at school but I am interested so I am hoping that that interest goes a long way in getting me through the 5 assignments which accompany this module. I need to get through these tough modules to get to the ones I am particularly looking forward to – the Literature. I am an avid reader so these modules hold real appeal for me and I am especially looking forward to the online discussion forums during that time. But first, it’s head down and delve back into the world of study. I graduated in 2003 so it has been quite a while from my brain was in study mode, and back then I had scheduled lectures to go to. This time I do have set dates for assignments and a timeline for study but fitting that in around family life and work commitments is going to take some getting used to. I am thankful for an immensely supportive family and a husband who always stands by my side in whatever I do. But, the reality is that this is down to me. I have to find the motivation, the discipline and the energy that this degree will command. It will no doubt have its highs and its lows. There will no doubt be thrilling moments and also moments filled with tears. I am anxious about how busy my life is going to be but am also excited about this new chapter. Going back to study is huge step, and also a big financial commitment, but it is something that is just for me, and that feels good. I cannot recommend to you that you go back to study as I haven’t yet found out how it is going to fit into my already busy life, but I would say if it is something you are seriously thinking about to give it a go. I am a great believer that there is a time for everything. Once upon a time, I was a busy Mum, that was my world. I loved all the mother and toddler groups, preparing all the weaning foods and everything else those early years of my boys’ childhoods involved. Now, as my children take new steps in their own lives so it is apt that I too copy their bravery and fix myself on a new endeavour. Wish me luck…and enough hours in the day.